May 2002 bring God’s peace to you and to those you love. We continue to keep you and all of our benefactors in our daily prayers. In addition to our heartfelt prayers for peace and for your intentions, we begin this year with a sincere prayer of gratitude for your support. It is you who keeps our work strong. Thank you! The popular series has aired on KNOM for over thirty years. 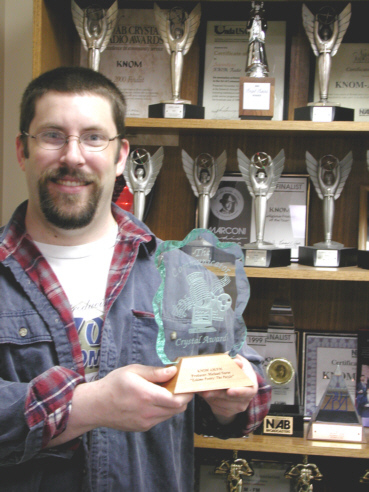 Several years ago the program’s original tapes wore out, and Mike has been carefully editing and combining stories, adding dramatic music and traditional Eskimo drum songs. Almost all of KNOM’s many awards recognize our mission’s extraordinary level of community service, but this one is different. The Communicator Crystal was created to honor excellence in creativity, and in recording and production quality. You can imagine how delighted we are, for the mission and for Mike personally. Please give yourself a pat on the back for helping to make this, and every element of our work possible. 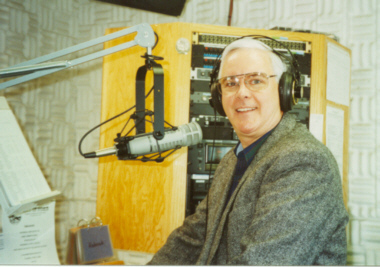 KNOM is the oldest Catholic radio station in the United States, supported entirely by your contributions, beaming 25,000 Watts of inspiration, education, information and companionship throughout 100,000 square miles of remote, roadless western Alaska. INSPIRATIONAL SPOT: Make prayer your first response, not your last resort. top Meet KNOM volunteer Ryan Conarro (left). A native of Dehlonega, GA, 21-year-old Ryan deejays the morning show and produces public affairs interview programs. He’s a 2001 graduate of New York University in theater and English. Ryan enjoys skiing, and energetic Friday night soccer games at the town’s gym. 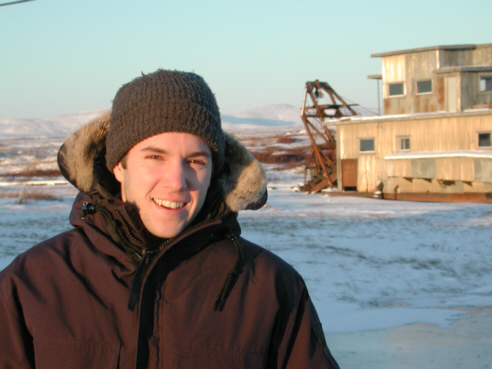 He won the role of narrator in Nome’s production of “Our Town,” scheduled for February, and he is cantor for the Sunday morning Masses which KNOM broadcasts from St. Joseph Church. You can see a sixty-year old gold dredge in this early January photo taken during a biting 30 MPH wind and temperatures in the single digits. STAR NOT-SO-BRIGHT: New Year’s morning, Nome suffered a power emergency when a couple of diesel generators, including Nome’s largest, failed. The utility company voiced an appeal over KNOM for people to sharply reduce their power consumption. Nome’s hospital ran on its emergency generator, and the town’s largest store turned off many of its lights. At KNOM, we darkened our Christmas star until the crisis was over. At this writing, it’s not certain what caused the problem. The best guess is that bitterly cold temperatures in December, about two weeks around -25°, may have reduced the lubricating qualities of the utility’s fuel oil. On one of the generators, 17 fuel injectors failed in 24 hours. KNOM broadcasts approximately 34,000 inspirational spots each year, and about 34,000 educational ones, too. The educational ones include various health subjects, alcohol and drug abuse, domestic violence, and so forth. Others teach history, earth science, and various Alaskan subjects. Please consider adding missions like KNOM to your will. We prayerfully place all bequests into major improvements and emergency savings. INSPIRATIONAL SPOT: A diamond is a chunk of coal that made good under pressure. INSPIRATIONAL SPOT: Having faith is hard when you’re battling a serious illness. You can plead with the Lord to be healed, or give it to the Lord. If you’re going to worry, don’t pray. If you’re going to pray, there’s no need to worry. top HMMM: The “Wizard for Windows” computer system controls our air signal and all of our studios. The computer automatically selects spots and songs. You can imagine engineer Les Brown’s wide eyes when he discovered the song which the computer had picked as the first one to be played after midnight on January 1st. Founded near a native village in 1833, St. Michael was the northernmost Russian settlement in North America. In 1897, it was the primary gateway to the Yukon River for gold seekers heading for Canada. Located 120 miles southeast of Nome, the village is home to 368 people, most of whom are Yup’ik Eskimo, with a bit of blood from early Russian traders. According to the State of Alaska, 83.5% of St. Miaheal adults are either unemployed or not in the work force, as jobs are scarce and families depend heavily upon subsistence hunting and fishing. NOT A “GLASS” ACT BUT GLASSY EYES: KNOM general manager Tom Busch (left) was still smiling, but growing a little tired toward the end of a seven-hour call-in which he produced December 21st. We estimate that about 10,000 area residents were mentioned during this marathon Christmas greeting program. Thanks to program director Ric Schmidt for screening the hundreds and hundreds of calls, which came in from dozens of western Alaska villages. We are told that caller volume was so heavy that it overloaded Nome’s long distance circuits. All of our telephone lines were busy virtually all of the time. As the program was ending, Tom averaged one new caller on the air every 65 seconds. “Thank goodness it’s only once a year,” he says. INSPIRATIONAL SPOT: Forgiveness begins at home. We see it, receive it, savor it. Then it turns to love, and we give it away again. top January 4th, volunteer Andrew McDonell (left) is done with the evening message program in Studio A. 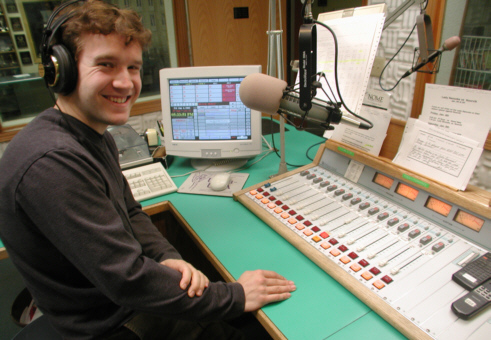 A University of Notre Dame graduate who was raised in South Bend, IN, Andrew is serving a second year with the mission as afternoon announcer and music director. Although we can broadcast live from any of our studios, Studio A is the workhorse of our air signal 24 hours a day. 30 YEARS AGO: In January 1972, KNOM received only 132 donations, far short of the 400 needed to keep the station operating. TAXING WORK: During the week of January 21st, we will mail receipts for all donors who contributed $250 or more during 2001. We are grateful for all donations. If you would like a 2001 receipt, regardless of amount, please let us know and we will be happy to send you one. May the Lord be with you this year. Thank you once again for your sacrifices on our behalf and your faithful help. God bless you! INSPIRATIONAL SPOT: Are you salt? Or are you pepper? Pepper calls attention to itself. That’s what it’s supposed to do. Salt, when used in appropriate amounts, calls attention to what it seasons. INSPIRATIONAL SPOT: One of the hardest spiritual tasks is to live without prejudice. We may not even be aware of them, or of how deeply rooted they may be. People different from us can stir up fear, discomfort, suspicion and hostility. We can lose our sense of security, just because they are different. Only when we realize that God loves us unconditionally can we look at these others as equally loved by Him. Then we begin to discover that the great variety in humanity is not cause for fear, but rather, an expression of the immense richness of God’s Heart.